And vilification of the Tea Party continues. Following the latest Obamacare defund battle, there's been a recent resurgence of Tea Party hatred from Democrats. Democratic Congressman Alan Grayson, known for inflammatory rhetoric, decided to capitalize on the fresh wave of anti-Tea Party sentiment. Grayson represents Florida's ninth district, a district that according to census.gov, is comprised of a minority majority. I'm not one to jump into the outrage du jour. I don't find it productive. But to use a burning cross and hooded klan members, one of the most blatant symbols of racism in recent American history, and to juxtapose that with the Tea Party, definitely warrants a response. Not only is comparing the Tea Party to the KKK insanely inaccurate, it suggests the congressman must have forgotten his history on the matter. It was the Democratic party that supported the KKK and elected a klansman to the Senate. But I suppose such facts are inconvenient. What overwhelming evidence would that be congressman? 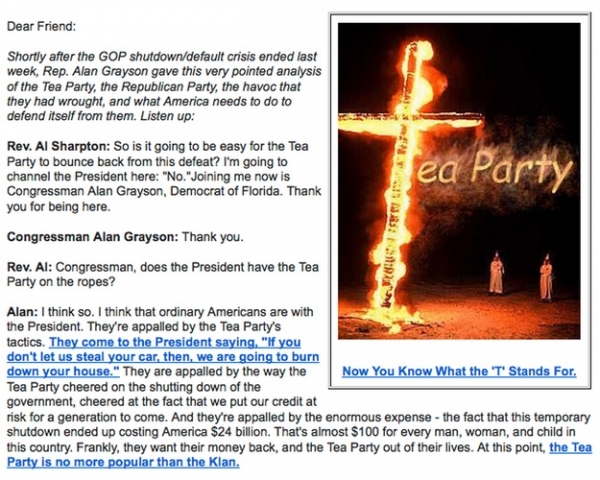 Grayson’s letter is part of an orchestrated effort by progressives to destroy the Tea Party. It’s a full scale assault that includes IRS intimidation, demeaning characterization by progressive politicians including President Obama and propaganda by left-wing TV hosts at MSNBC. Not only should Grayson’s constituents be outraged over his inexcusable and divisive language, but freedom-loving Americans should hold Grayson accountable and not allow such behavior to go unchallenged. This email is totally laughable as his district has a majority of Puerto Rican Hispanic voters (65%). Even the blacks and Mulatos are Hispanic. The rest are white conservatives. What the Hispanics have in common with a KKK targeted black minority is questionable! They don't exist in his district! This has to be targeted to outside influences. Perhaps campaign donors? I don't care why Grayson said it or what he intends to accomplish. There is nothing that will excuse this kind of behavior. I intend to donate until it hurts to everyone who is running against him, no matter what their political ideology. This despicable liar must not be allowed to stand. ProgressNowColorado, a group of paid left-wing propagandists, has written yet another dishonest article, this time their assessment of Denver’s Tax Day Tea Party. Have pictures from your tea party that you would like added to our map? Simply leave the location of your event, with a link to the pictures or video in the comments section below, or on the comments section of the map. While many members of the mainstream media have been negligent in covering what has become a nationwide, grassroots movement, activists across the country have taken it upon themselves to make sure the word is getting out. I just wanted to take a minute and update you on our efforts to fight taxes and spending in Oregon. Many of you will be excited to learn that we are planning Taxpayer Tea Parties in multiple cities across Oregon! This is because of the overwhelming interest in joining our effort to fight wasteful government spending and the massive bailouts.You can rsvp for these events by visiting IamWithRick.com and signing up to attend the tea party closest to you.As CNBC's Rick Santelli pointed out, it's time for the American peopleto defend free markets and take to the streets in protest!SIGN UP NOW for the protest closest to you! We will send you updateson the events as we get them.Also, if you care about wasteful spending and higher taxes, you mightwant to take a minute to send Governor Kulangoski a message. As you know, we’ve been closely following one bad idea after another that has come out of Salem. First it was a massive cigarette tax hike. Then it was plans for a tax on mileage, higher registration and title fees, a gasoline tax hike, and even an outrageous 1900% beer tax hike! So far, it’s been all taxes and no cuts that go after waste and the regulations that burden businesses in Oregon. Now, rather than trying to lift the financial burdens of hurting Oregonians, legislators are floating more plans to rake in more cash. These include raising the state income tax, an even bigger gasoline tax hike, and taking away Oregon’s kicker! States across the board are facing budget problems, but taking more money out of the pockets of people who are already struggling to make ends meet isn’t the answer. Take Action and tell your elected officials that you oppose more tax and spend plans. Like everyone else, Oregon’s leaders need to reexamine the books and stretch our dollars a little further.